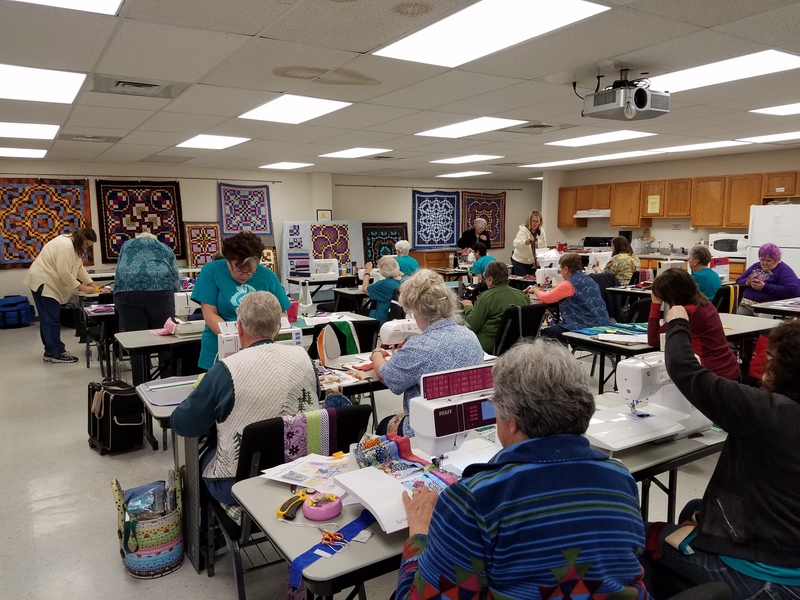 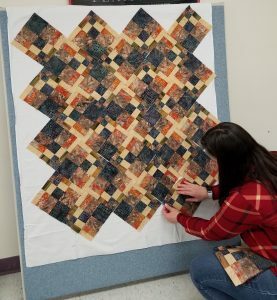 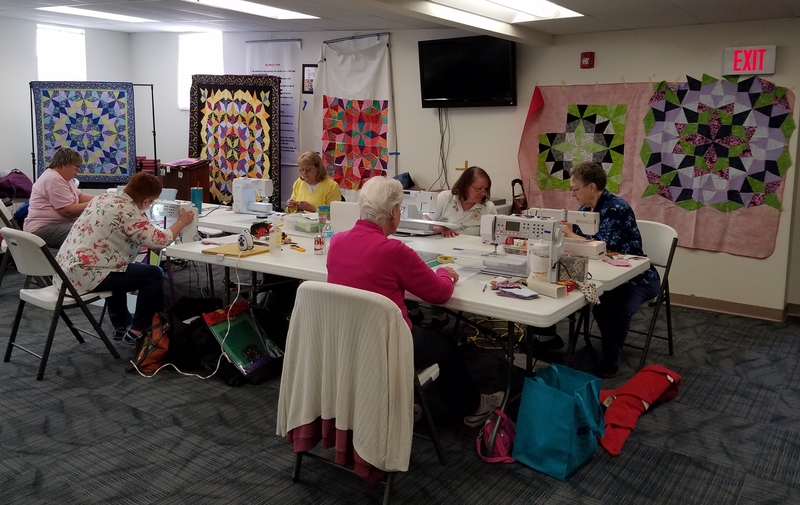 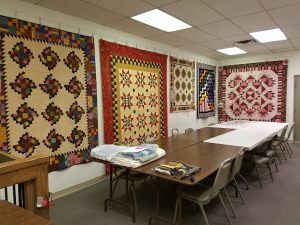 In late of April, I taught in Cheyenne, WY and visited The Quilted Corner quilt store at 309 W Lincolnway, in the heart of downtown. 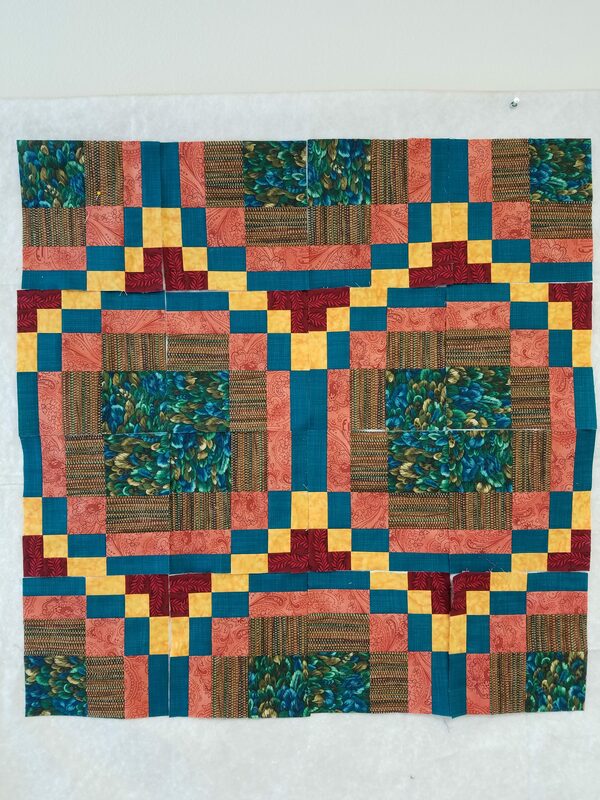 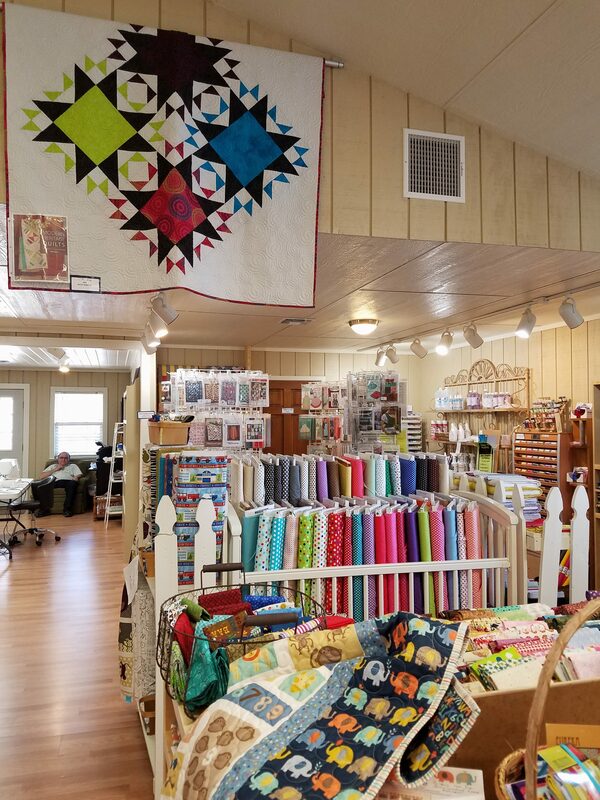 The store is inviting, with over 2,500 bolts of quilting cottons and many lovely quilt samples hanging on the walls. 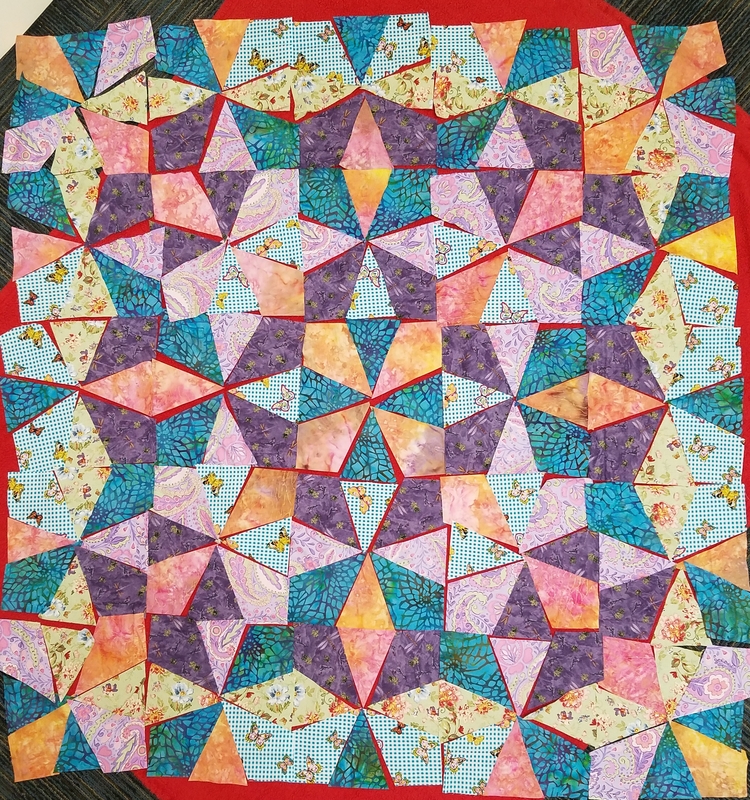 I particularly liked the striking Snail Trail pattern in combination with the stars. 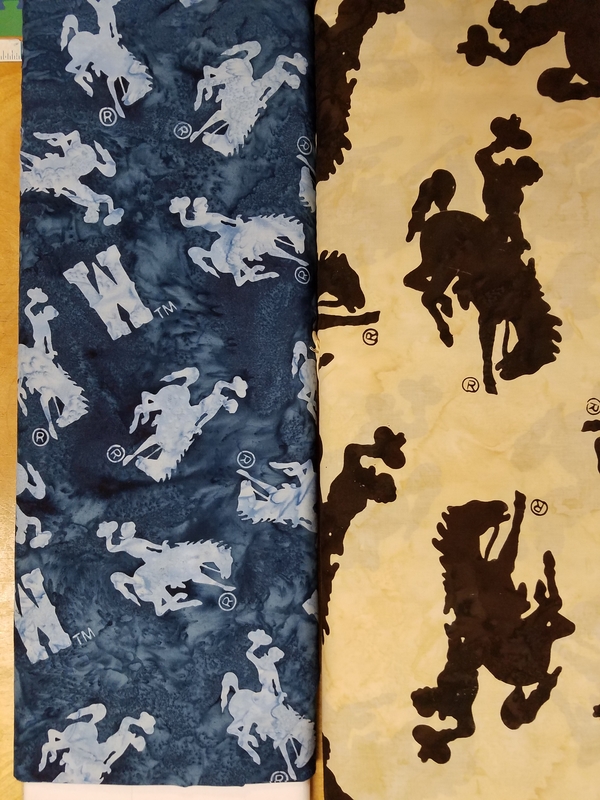 The local specialty fabrics have the Wyoming W and the bucking bronco motifs. 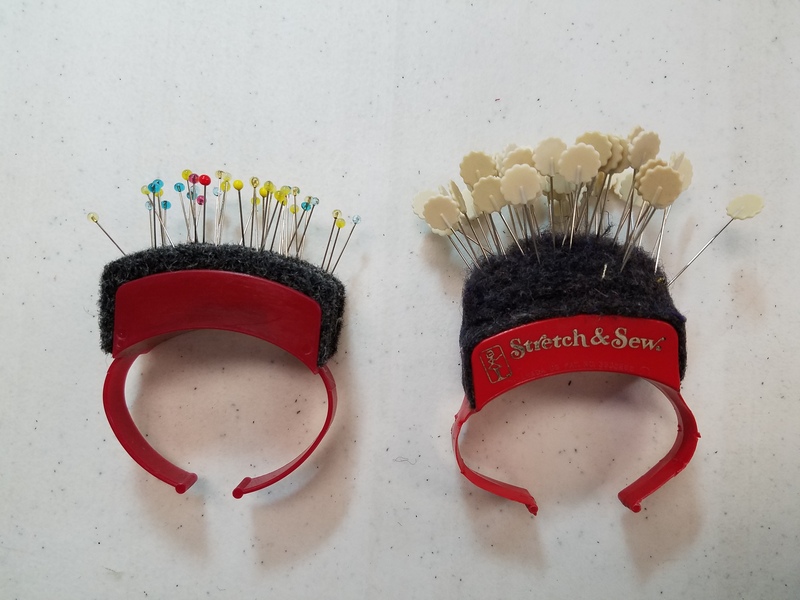 These are produced especially for retailers in WY and aren’t available anywhere else. The quilt behind the lamp is made with one of these bucking bronco fabrics. 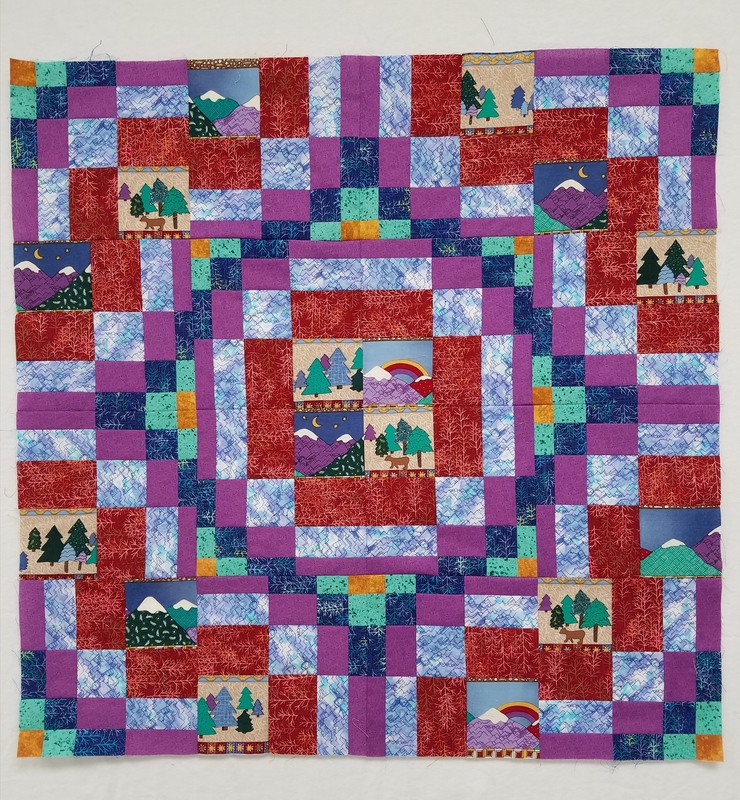 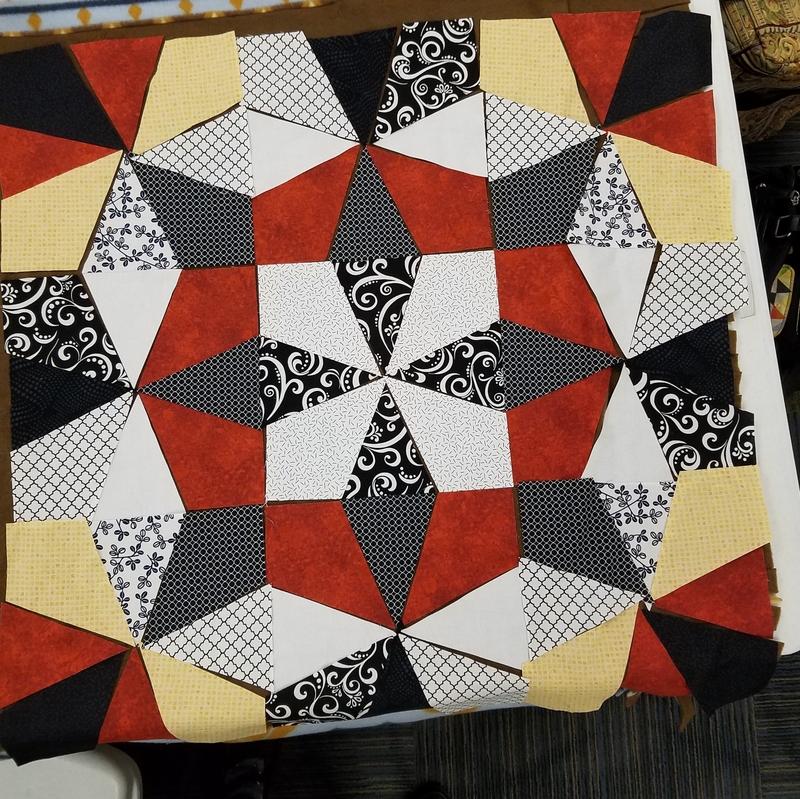 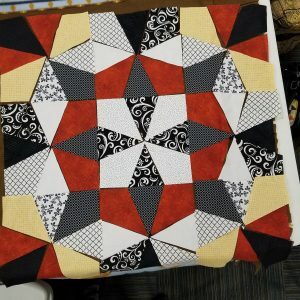 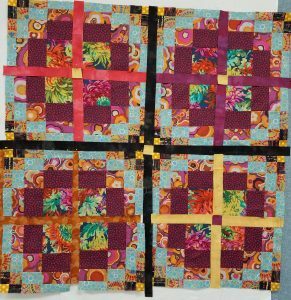 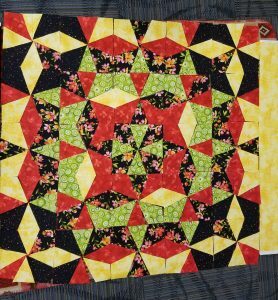 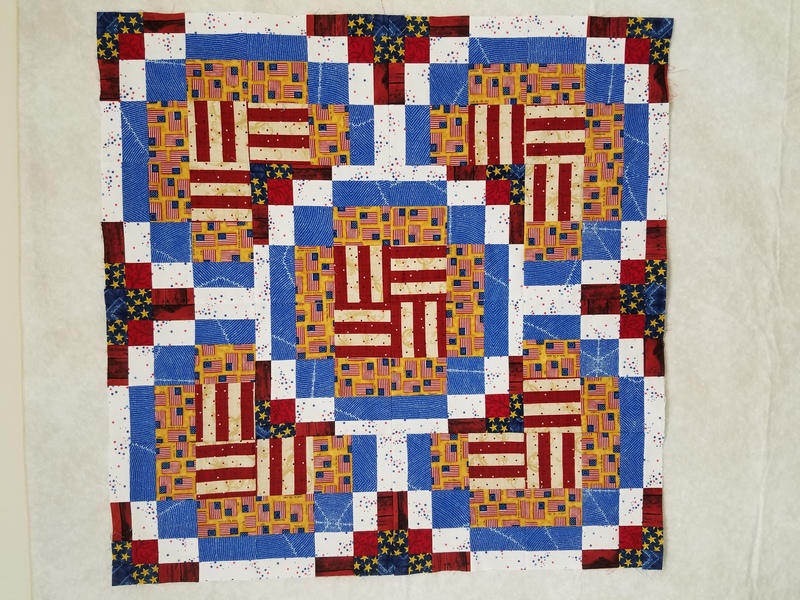 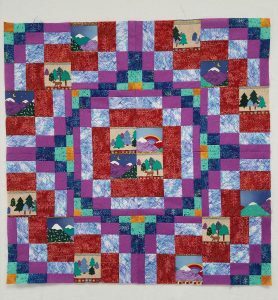 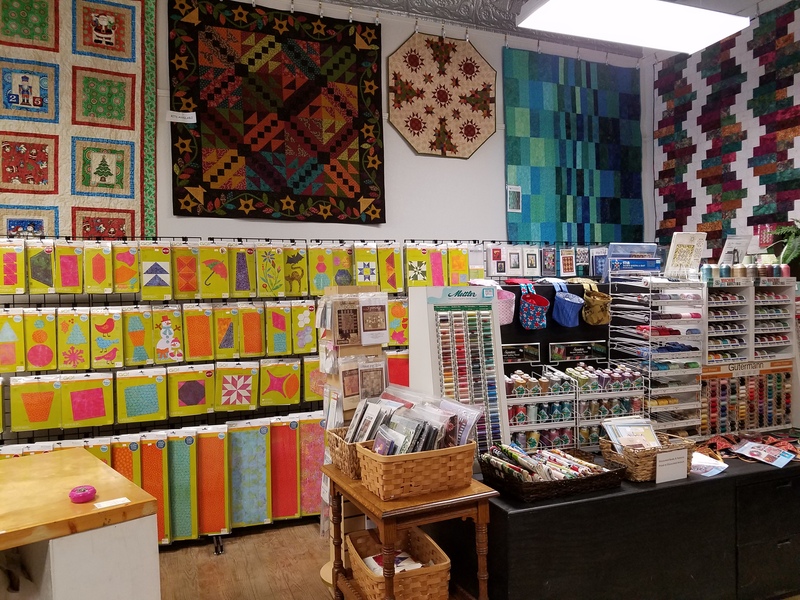 The store offers a large selection of Accuquilt cutting dies and has a club that meets one a month to offer tips on using these. There is a classroom in the back and they teach a variety of quilting classes. 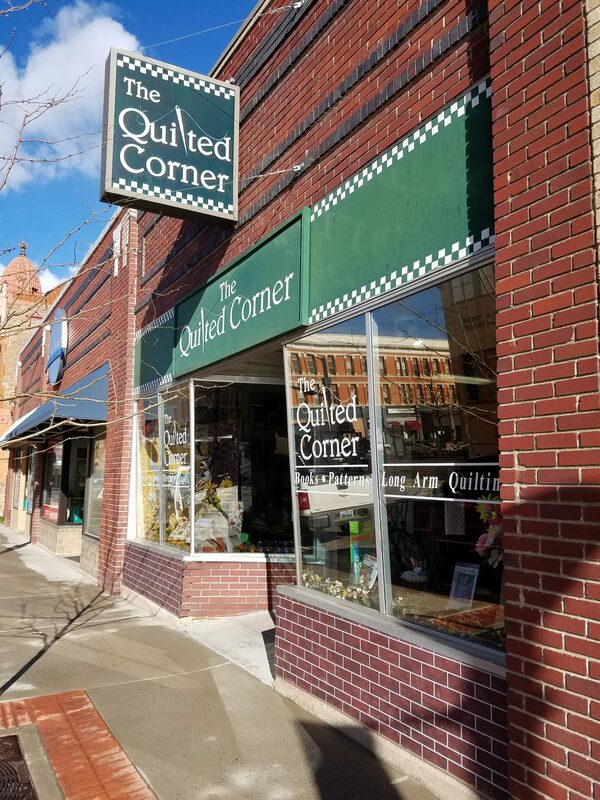 If you are in Cheyenne, pop in and check out this store. 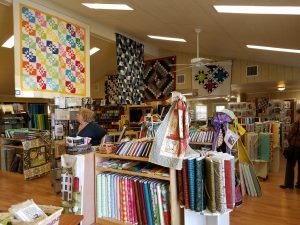 As well as fabric, they are well stocked with notions, books and patterns. 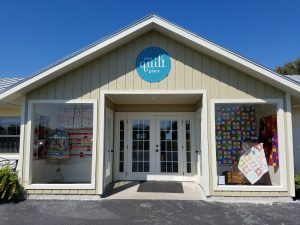 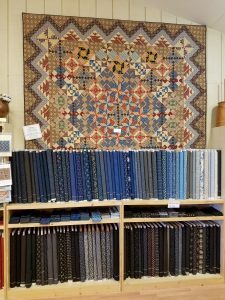 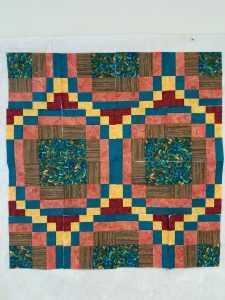 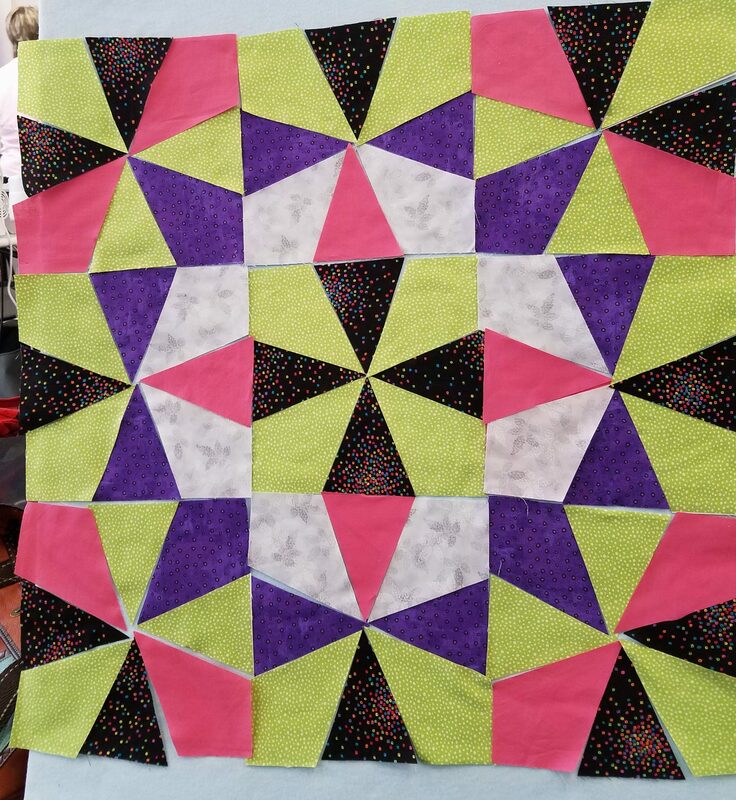 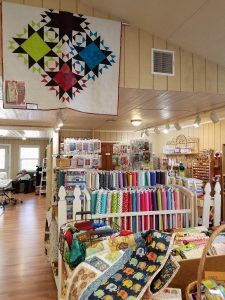 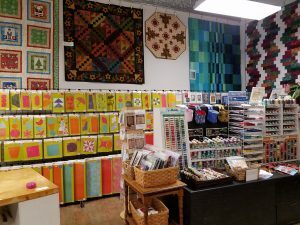 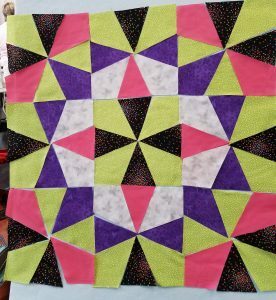 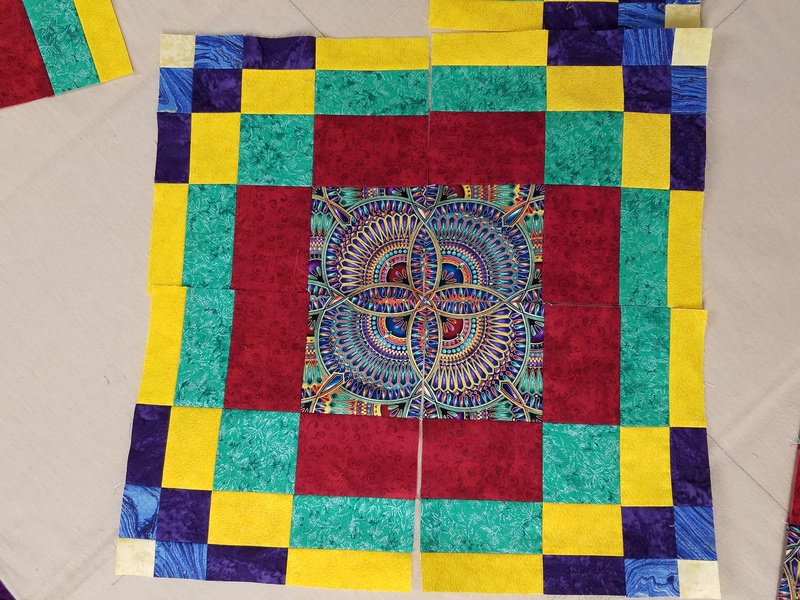 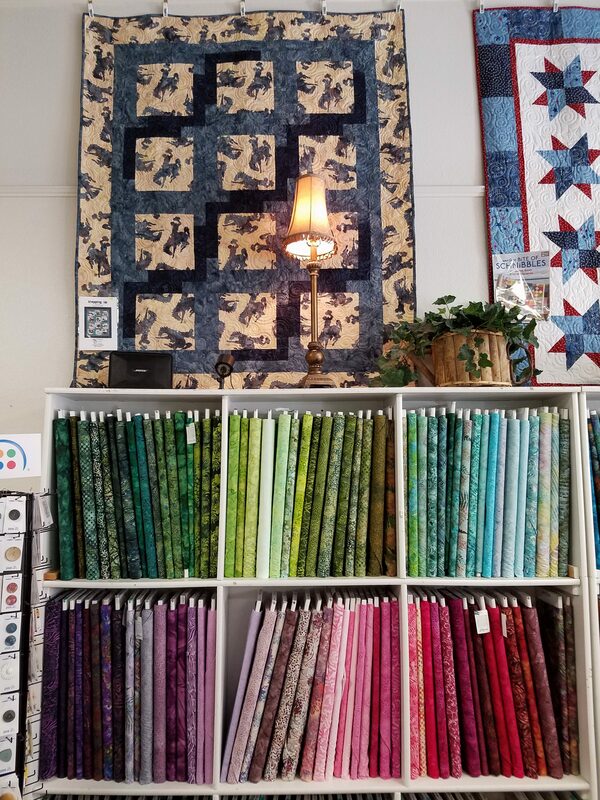 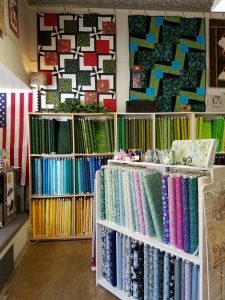 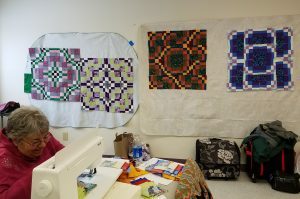 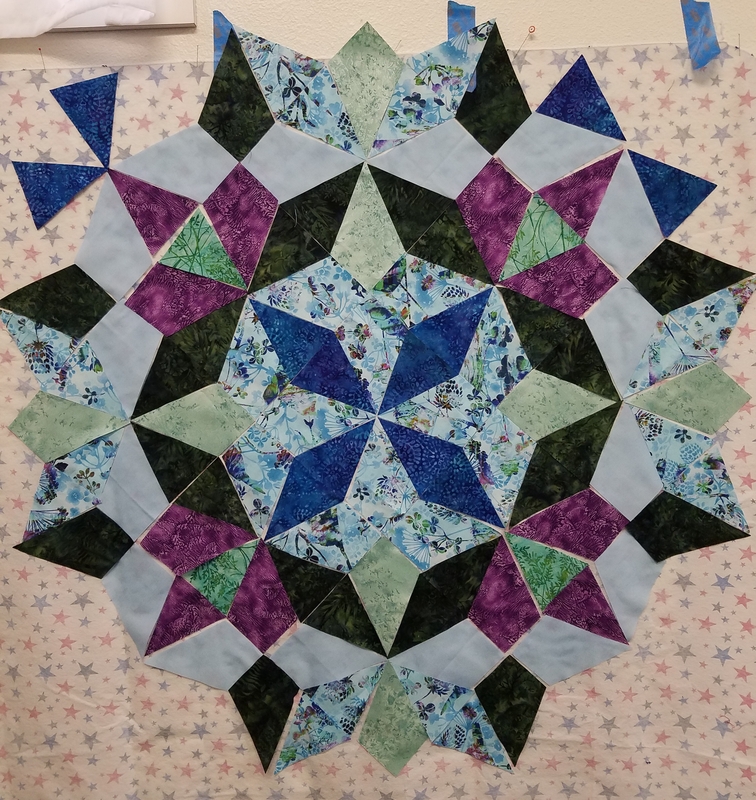 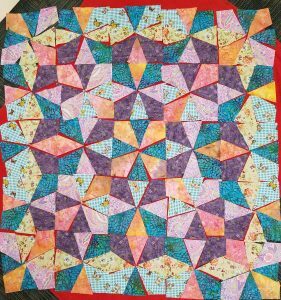 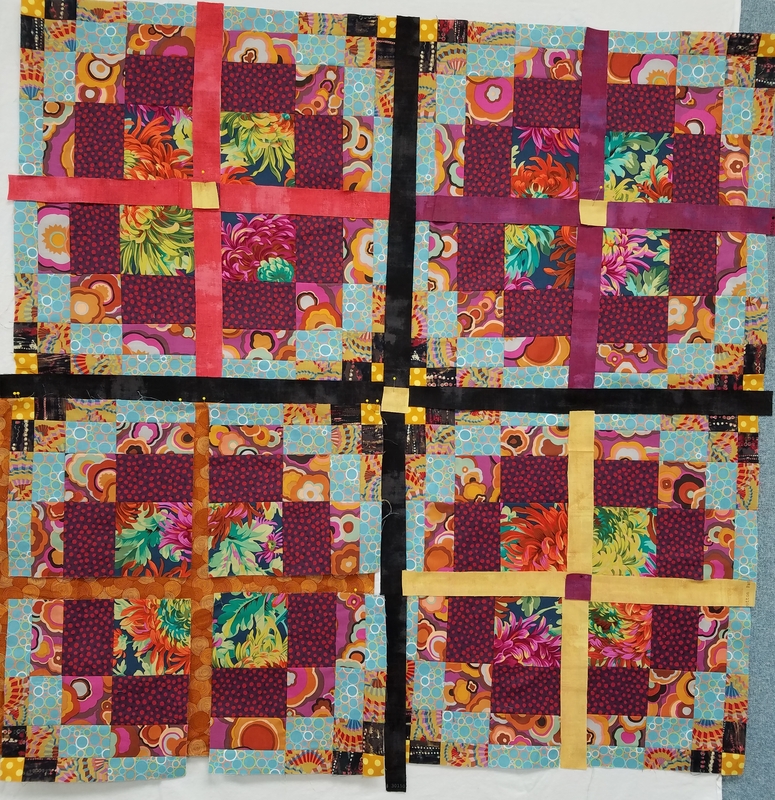 I was delighted to revisit the quilting store, One Quilt Place, in Fredericksburg in March when I was teaching in the area. 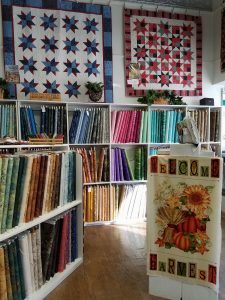 I first went there three years ago, when my host at the New Braunfels Area Quilt Guild took me sightseeing in the Hill Country. 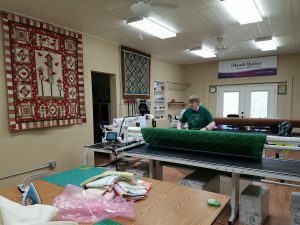 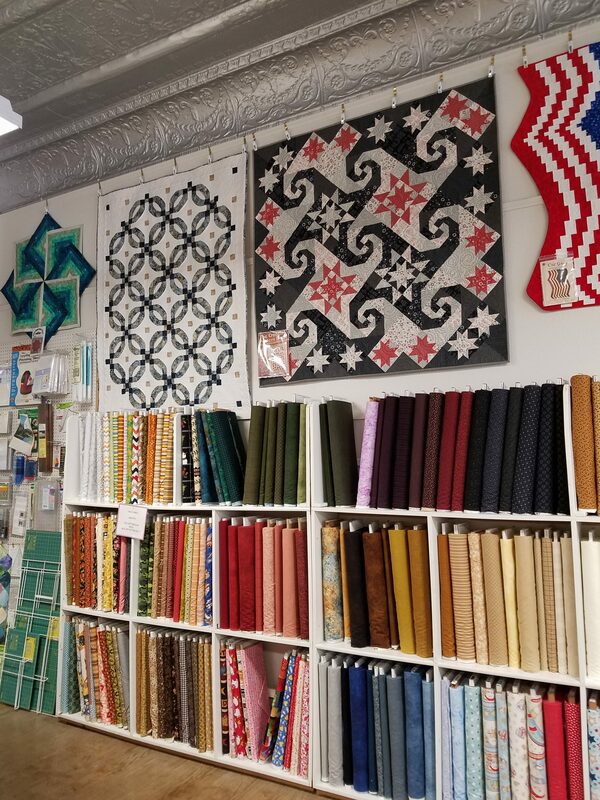 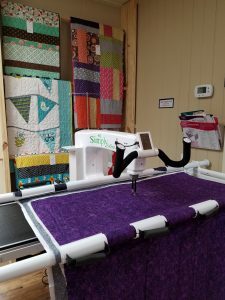 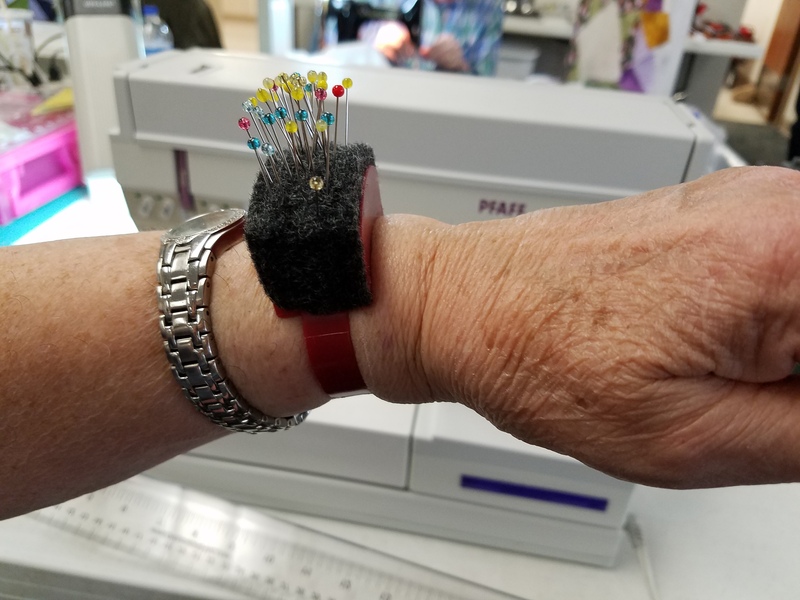 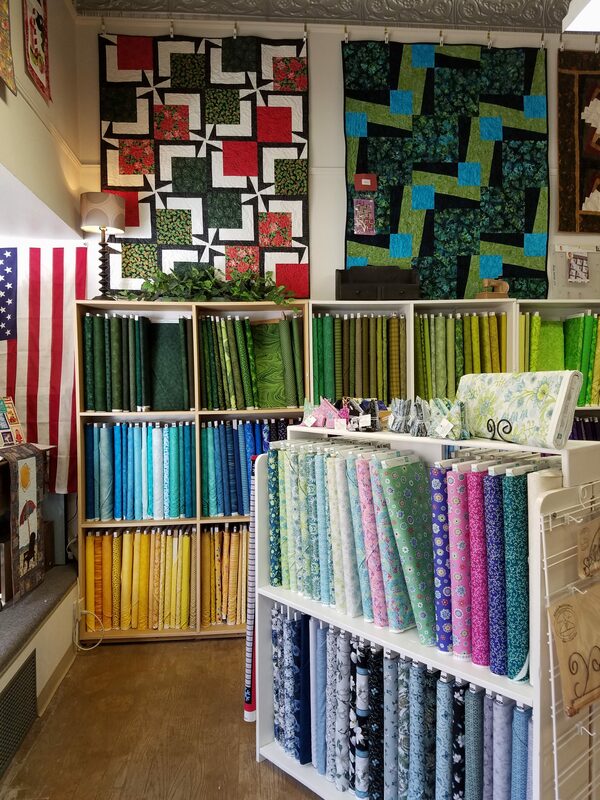 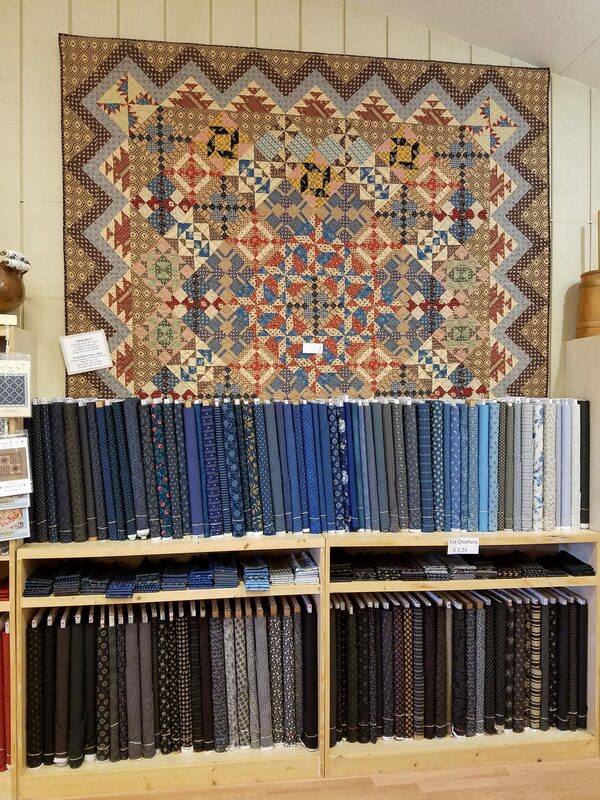 It was fun to reconnect with Beverly Allen, the owner, and to see how the store has expanded with a 1000 square feet addition making more space for inventory, and accommodating two long-arm quilting machines. 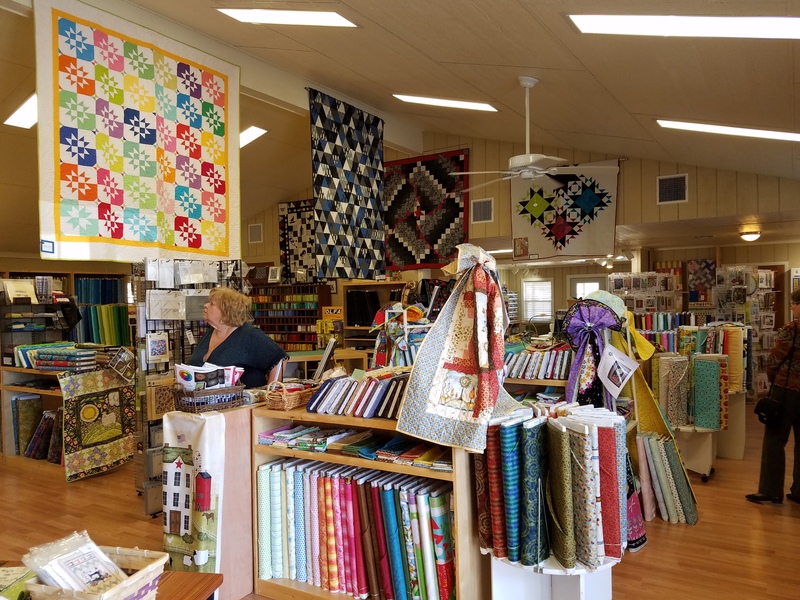 They offer classes in long-arm quilting and rental of the machines, and are also dealers for Handi-Quilt machines. I was impressed with the variety of fabrics in this lovely light and spacious store. 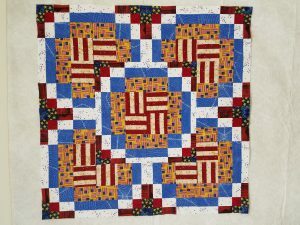 Special areas were devoted to holiday fabrics, patriotic, batiks, solids, 30s-40’s reproduction, Civil War reproduction, TX wildflowers and more. 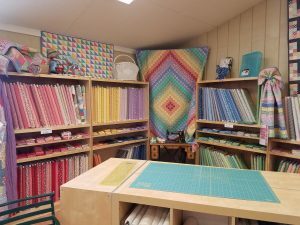 There was a nice area especially for wool. 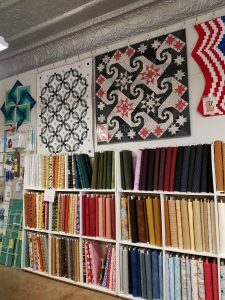 In addition to the fabrics, they had a great selection of books, patterns and notions. 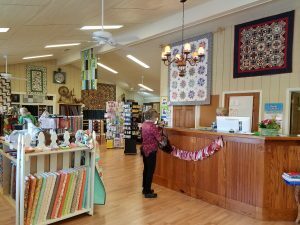 This store is definitely worth a visit if you are in the Hill Country. 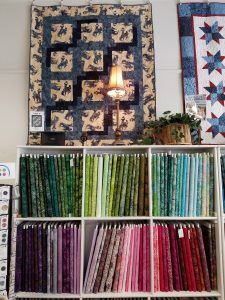 If you are lucky, like me, you will see swaths of bluebonnets outside too!